The spinal cord is a major component of the central nervous system (CNS) that forms the vital link between the brain and most of the body. Its 31 spinal segments connect the CNS to the organs and tissues of the neck, torso, and limbs. The spinal cord also performs important processing functions to maintain balance and respond quickly to stimuli. The spinal cord is a mass of nervous tissue that extends inferiorly from the brain stem through the vertebral canal of the cervical and thoracic regions, ending around the T12 or L1 vertebra. It is a long tube about 18 inches (45 cm) in length and around half an inch (1 cm) in diameter at its widest point. At its inferior end, the spinal cord tapers to a point known as the conus medullaris and gives rise to many large nerve fibers known as the cauda equina. The cauda equina descends through the vertebral canal from the conus medullaris to the coccyx. Each of the nerves that form the cauda equina exit the vertebral canal at the intervertebral foramina of the lumbar, sacral, and coccygeal regions of the spine. - 1 coccygeal segment in the tailbone. Each spinal segment is named after the anatomical region where it is located and is numbered in order from superior to inferior. For example, the cervical segments are named C1 through C8, or first cervical segment through eighth cervical segment. Each segment contains a pair of spinal nerves that exit the spinal cord through the intervertebral foramina of the surrounding vertebrae. In the cervical region, the first spinal segment (C1) is found between the skull and the C1 vertebrae. The next 7 spinal segments are found between each of the cervical vertebrae, with the C8 segment between the C7 and T1 vertebrae. 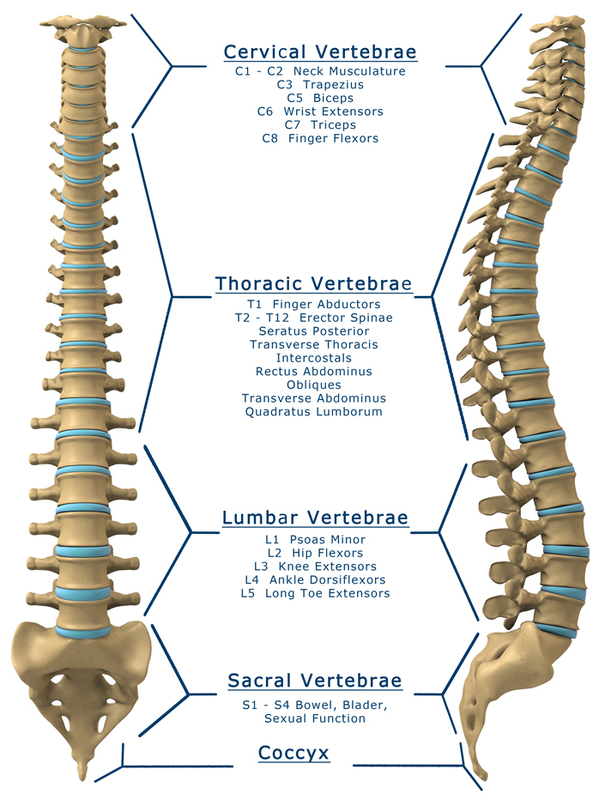 This pattern continues with the thoracic and lumbar vertebrae, where there is a one to one correspondence between spinal segments and vertebrae. In the sacral region, the sacrum is made of 5 fused vertebrae with their own intervertebral foramina, so each segment is named after the level of the sacrum that it exits through. Finally, the coccygeal nerves (the last pair of spinal nerves) exit the vertebral canal at the inferior end of the sacrum and pass anterior to the coccyx. The spinal cord contains many myelinated neurons in its outer region of white matter. These neurons carry information either toward the brain in ascending tracts or from the brain to the body in descending tracts. Ascending tracts are made of afferent or sensory neurons that provide sensory information to the brain. Descending tracts are made of efferent or motor neurons that carry signals to stimulate effectors such as smooth muscle, cardiac muscle, skeletal muscle, or glands. The gray matter in the center of the spinal cord contains many relays for the afferent and efferent neurons of the ascending and descending tracts, as well as many interneurons that integrate reflex information. To speed the body’s responses to stimuli, many involuntary decisions are made in the spinal cord instead of the brain. These responses, known as reflexes, help to maintain the body’s balance and muscle tone and can protect the body from harm. For example, when a person touches a hot object, the pain signal is integrated in the spinal cord and a nerve signal is sent to muscles in the arm to pull the hand away from the hot object. By the time the brain realizes that the body is in pain, the affected body part has already been moved safely away by the spinal cord. This phenomenon is also observed when a reflex hammer is used to strike the patellar ligament in the knee, causing an involuntary knee-jerk reaction. This reflex is integrated in the spinal cord in response to stretching of the quadriceps femoris muscle by the hammer blow. The brain does not realize that the leg is kicking until it already has kicked, resulting in a mild shock to the conscious mind. The spinal cord is made of nervous tissue organized into two major types: gray matter and white matter. - Gray matter is unmyelinated nervous tissue that performs the integration and processing function of the spinal cord. It is found in the interior of the spinal cord and looks very much like a butterfly when viewed in cross-section. The wings of the butterfly are made of the gray horns, which correspond to specific types of nerve cells. The anterior horns are made of somatic motor neurons that stimulate skeletal muscle. The lateral gray horns are made of autonomic motor neurons that stimulate smooth muscle, cardiac muscle, and glands. The posterior horns contain axons of sensory neurons that enter the spinal cord from spinal nerves and carry information about the condition of the body. Finally, interneurons are found in the gray matter to process and integrate the information passing through the spinal cord. - White matter is made of myelinated nervous tissue that is specialized for communication. The axons of the neurons passing through the white matter tracts are wrapped by Schwann cells that speed the conduction of the nerve signals through the spinal cord and decrease the response time of the body to stimuli.